Car odors tend to overstay their welcomeâ€”like last nightâ€™s carryout, this morningâ€™s gym clothes, or last weekendâ€™s trip to the dog park. 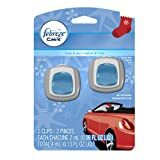 Febreze Car Vent Clips send odors packing and add a note of freshness to your ride. Intensity settings put you in the driverâ€™s seat, so you can select the perfect amount of scent for you and your passengers. Itâ€™s a long-lasting way to get freshness that goes the distance.